The Marihuana Tax Act of 1937 was drafted by infamous anti-cannabis prohibitionist Harry Anslinger, and signed into law on August 2, 1937. Up until this law was passed, cannabis products were legal to sell in pharmacies and drug stores, so long as they were properly labeled and regulated, but it was during the 1930s that the mainstream attitudes towards cannabis began to sway greatly towards negative opinion. This was one of the first acknowledgments by the US government of the new and notorious drug known as “marihuana.” The name itself, marihuana, was derived from Mexican Spanish, although the linguistic origins have been widely debated. From the Aztec language Nahuatl to the Chinese word ma ren hua, meaning “hemp seed flower,” marijuana truly has many roots, but the word was popularized by Harry Anslinger as part of his campaign to instill fear of the drug. Before this, it was commonly referred to as "hemp" or “cannabis sativa,” and was considered “a fashionable narcotic,” often found in over-the-counter pharmaceutical products like cough syrups. 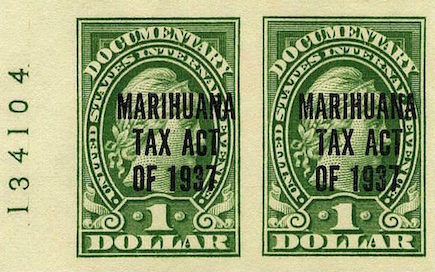 The Marihuana Tax Act of 1937 was originally passed to levy taxes on hemp products and on the commercial sales of cannabis products. Farmers could acquire tax stamps for the cultivation of fiber hemp, physicians would be charged a tax for prescribing cannabis, and pharmacists would be required to pay a tax for selling cannabis. The American Medical Association was strongly opposed to the act, arguing against the measure in court and proposing instead that cannabis be added to the Harrison Narcotics Tax Act. The law was enacted a year after the production of the notorious anti-cannabis film, Reefer Madness, originally titled Tell Your Children, but also known as The Burning Question, Doped Youth, and Love Madness. Reefer Madness was financed by a church group before being widely released as an exploitation film to warn the public about the dangers of cannabis use. It was just one in a long line of education-exploitation films of the era, including Marihuana (1936), Assassin of Youth (1937), and Devil’s Harvest (1942). Over the years, many have speculated that the reason for the campaign against cannabis boiled down to demonizing the hemp industry because it was a low-cost substitute for paper pulp. The paper industry, and more specifically, the newspaper industry, led the charge against cannabis with Anslinger. William Randolph Hearst, Andrew Mellon, and the DuPont family all had major investments in the timber and newspaper industries, and a rise of hemp would have seemingly undercut their profits. Curiously, years later, manufacturing paper with hemp as the raw material proved that hemp lacks the qualities needed to become a major competitor of the traditional paper industry, as it does not contain a high enough concentration of cellulose to be an effective substitute.